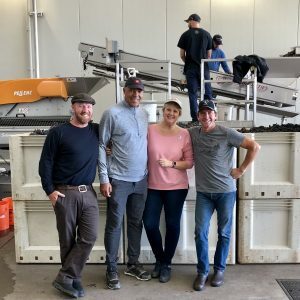 If you follow Okapi Wines on Facebook, you know we are starting to promote more special offers and interesting tidbits about our wines, winemaking, grape growing, visiting Napa Valley and more. Right now, you can get free shipping on orders of our “Perfect Pairing” gift of two bottles of Okapi – gift wrapped! That offer is only available for a limited time, but we are always happy to customize a gift for you. Follow us on your favorite social media platform so that you never miss a deal. More experienced winegrowers around us say that the 2012 vintage will benefit from the nearly perfect growing conditions we experienced this year. 2012 is “sixth leaf” for us, which means the vineyard has come into its maturity just in time to take advantage of nature’s generosity. We harvested over seven tons of Cabernet Sauvignon grapes from our little vineyard this year – more than double the yield of the last two years. The quality of the fruit is outrageous, and we can hardly wait for our first post-crush barrel tasting this spring. When you sign up to become a member of our community, we’ll keep you in the loop about developments in the vineyard and at the winery. We want you to feel like insiders…members of an intimate group that shares a cool secret. When you decant Okapi with friends, invite them into our circle, too. Members will receive notice of new releases, invitations to join us for tastings and other events, and – importantly – a discount on each bottle of Okapi. We want to hear from you as we learn how to make the ecommerce part easy for our customers. Ask lots of questions. We’ll use this space to share what we have learned so far, and what we figure out as we go along. Cheers!